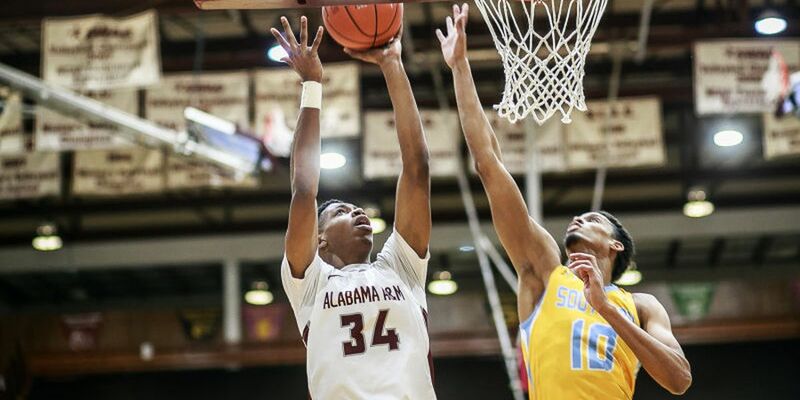 NORMAL, Ala. (AP) — Andre Kennedy had a career-high 26 points, on 11-of-15 shooting, and 10 rebounds to help Alabama A&M hold off Southern on Saturday night for a 68-62 win. Tre Todd added 14 points and Jalen Reeder scored 11 for Alabama A&M. The Bulldogs (3-17, 2-4 Southwestern Athletic Conference) snapped a three-game skid and won for just the second time since Christmas. Todd hit back-to-back 3-pointers to cap a 17-3 run that made it 24-17 and AAMU led the rest of the way. Kennedy converted a 3-point play to give the Bulldogs an 11-point lead, the biggest by either team, with 6:58 to play. Southern scored 13 of the next 17 points to trim its deficit to 62-60 when Jayden Saddler made a layup with 1:14 left but Todd answered with two free throws and the Jaguars got no closer. Aaron Ray and Sidney Umude scored 17 points apiece for Southern (3-17, 2-5). Saddler, a freshman, added seven points, six assists and a season-high five steals.